Leroy J. Roller, 92, of W Larabee Street, Port Washington died Wednesday, June 15, 2005 at Columbia St. Mary’s Hospital – Ozaukee Campus in Mequon. 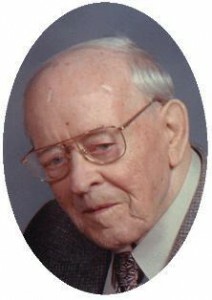 He was born February 14, 1913 in Port Washington, Wisconsin to Jacob and Katherine Krier Roller. He met Viola Wester of Port Washington and they were married October 16, 1937 at St. Mary’s Church in Port Washington. The couple move to a house Leroy built on W Larabee street in 1951 and raised a family. Leroy worked for Simplicity Manufacturing for 37 years. He retired as a machine shop foreman in 1962, but continued to work as a grounds keeper at the plant for the next ten years. He enjoyed yard work and being outside. He was a member of the International Association of Machinist, Local 1430, the former Holy Name Society and Catholic Knights. Leroy crafted lighted Christmas trees and gave to family and friends. He is survived by his wife Viola, and children Don Roller of Port Washington and Shirley (Andrew) Lee of Belmont, California. Leroy was the proud grandfather of Erik, Brannon, Jordan and Adam Lee. Further survived by other relatives and friends. Preceded in death by three brothers, Clarence, Wilmer and Milton Roller. Funeral services 7 pm Wednesday, June 22, 2005 from the funeral home to St. Mary’s Church for Mass of Christian Burial at 7:30 pm. The Rev. Allan Sommer will be the celebrant. Interment parish cemetery. Visitation 4 – 7 pm Wednesday at the funeral home with a 4 pm rosary service.